Here's a fun book for those who need new inspiration for their crafts or hobbies. 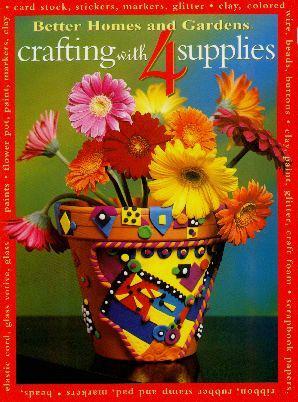 Crafting with 4 Supplies offers six chapters with projects to make using only four kinds of supplies. For example, in chapter 5 there are about 20 different designs on glass votive candleholders, using glass paints, beads, and elastic cord (the fourth item is the candleholder) to make gorgeous and personal artefacts. I loved the Western Glow on page 119 and A Coat of Beads on page 22. None of the projects appear too difficult to make. I also like their Christmas Cards and decorations ideas - so much more meaningful than store-bought baubles. There are also templates of certain designs so you really can't go that wrong. Of course you can also do your own thing and I am going to try and make the project on page 21 (All-Buttoned-Up Candles) but will use sparkly beads instead. Conclusion - Ideal as a gift for clever crafters or as something new for you to attempt.